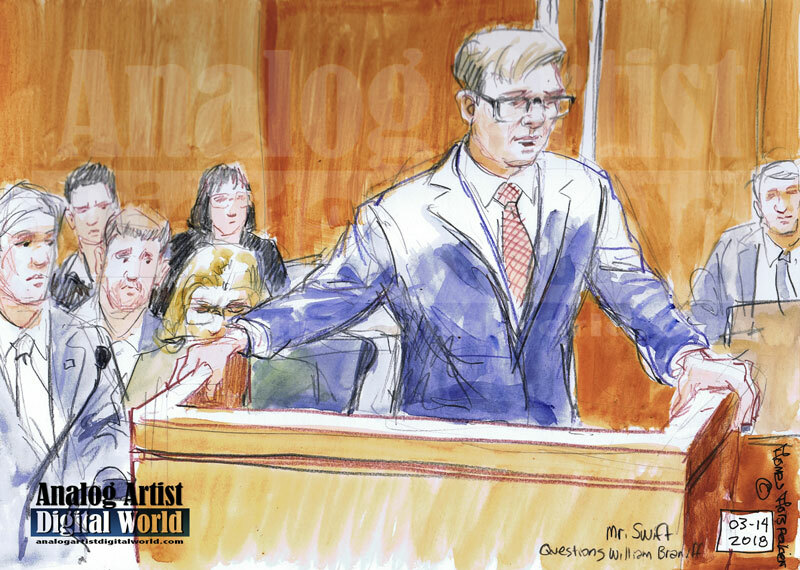 Defense attorney Charles Swift spent plenty of time cross-examining witnesses from the State in the Noor Salman trial. She is accused of aiding and abetting her husband Omar Mateen in the mass murder of 49 Orlando citizens at Pulse. He would stop and linger, taking time to ask questions that might raise doubt in the jury's mind. The jury consists of 12 woman and 6 men. 12 are on the actual jury and 6 are alternates. None of them has been informed if they are the alternates in order to guarantee that they all pay close attention to the details of the case. FBI evidence collection expert Lauren Regucci took the stand to describe the steps taken to document the evidence collected from the van that Omar Mateen parked near the Pulse Nightclub. Agents are trained to draw maps that help clarify where items were found along with photos, where items were found. The vehicle was parked under a carport near a boat. The windows had been blown out by a bomb-seeking robot. A 38 revolver pistol was found near the vehicle along with items known as speed loaders. Speed loaders allow all the bullets to be loaded at once saving time when you want to kill fast. Also found near the vehicle were a green rifle bag and a long gun rifle case. A child's stroller was also on the ground on its side. It was a strange combination of the domestic mixed with the murderous. 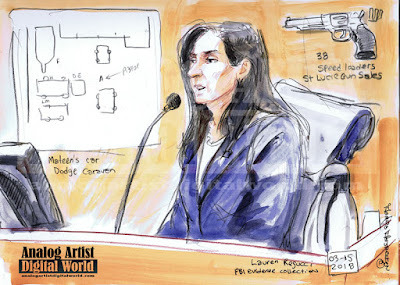 Lauren held up a pistol box along with each item found so that the jury could see. The SIG Sauer MCX assault rifle was found next to the gunman's dead body inside the club bathroom, so it was not among the items found outside. Tampa FBI Special Agent Lynn Billings was in charge of collecting evidence inside the club. 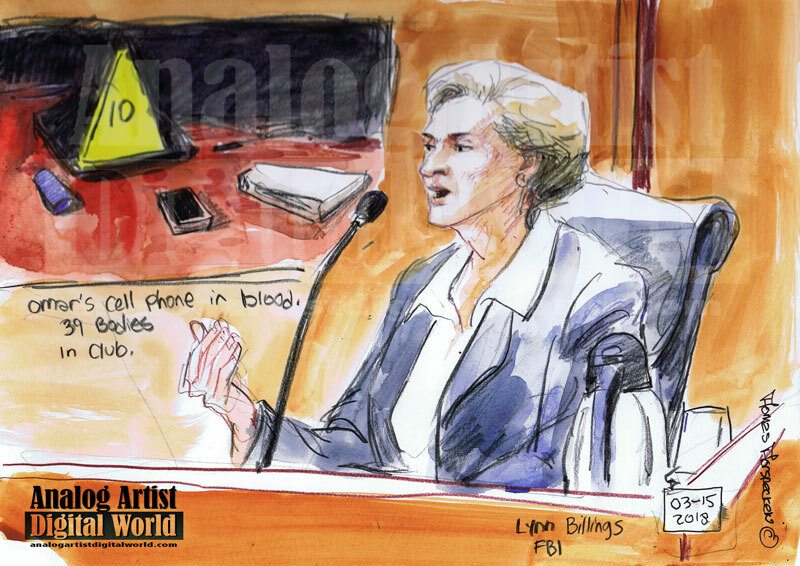 She showed the jury a photo of Omar Mateen's cell phone that was found submerged in a pool of blood. Each item in the club was assigned a yellow marker and the distances between items was noted. She held up the the rifle purchased on June 4, 2016 by Omar Mateen and verified that the serial number on the gun matched the serial number on the receipt from Saint Lucie Gun Sales. The gun was submitted into evidence. There was a knife found next to Omar Mateen's body along with the Glock handgun that he had also purchased in the weeks leading up the the massacre. The gun holster was found on the gunman's body. Thirty-seven other bodies were found in the club. "There were cellphones ringing,” she said. “People were constantly calling cellphones that were scattered throughout the club." The FBI spent nine days collecting evidence. They measured distances between objects and figured out the shooting trajectories of shots whenever possible. They then proceeded to tear out the drywall to collect any other bullets that had penetrated the walls. Tape on the walls marked places where bullets had entered. Furniture as well was dissected for evidence collection. Besides collecting near Omar's rental van and inside the club, a map was also set up that was used to make sure any evidence in the blocks around the club was collected. Every imaginable area was searched before Orange Avenue could be once again opened up to traffic.